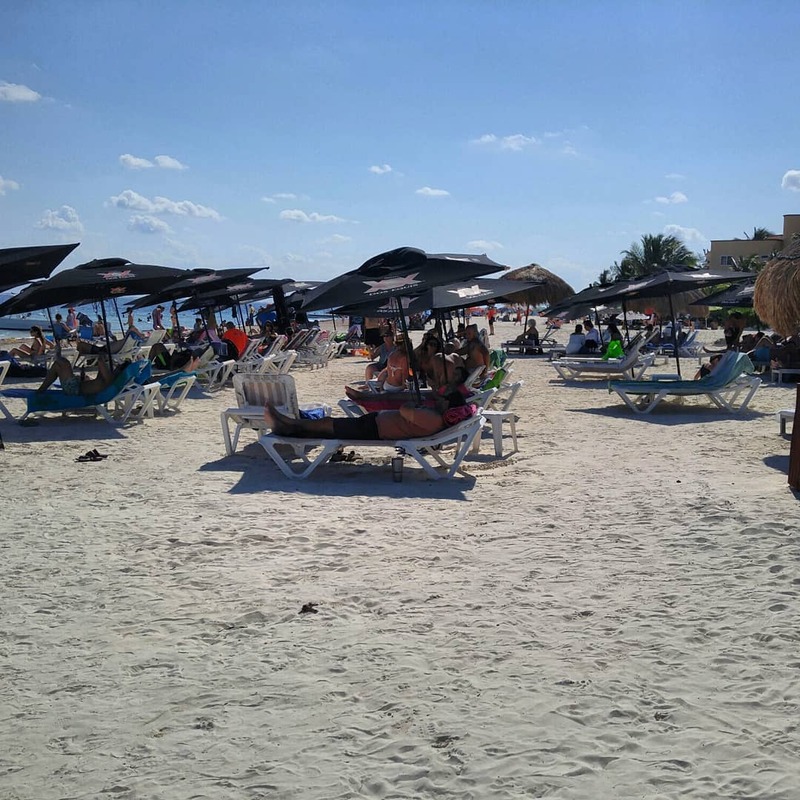 If you could go to the beach on Christmas Day, you probably would, and that is what it seems like everyone decided to do today in Puerto Morelos. A lovely day and a busy one at the beach! Tomorrow it should be much quieter again. 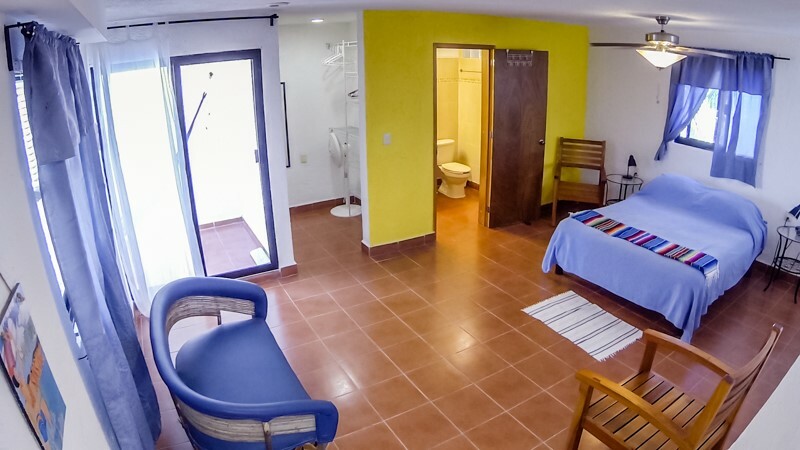 If you want to join the fun in Puerto Morelos, check out Casa de los Viajeros, one and two bedroom suites near the beach and the square. 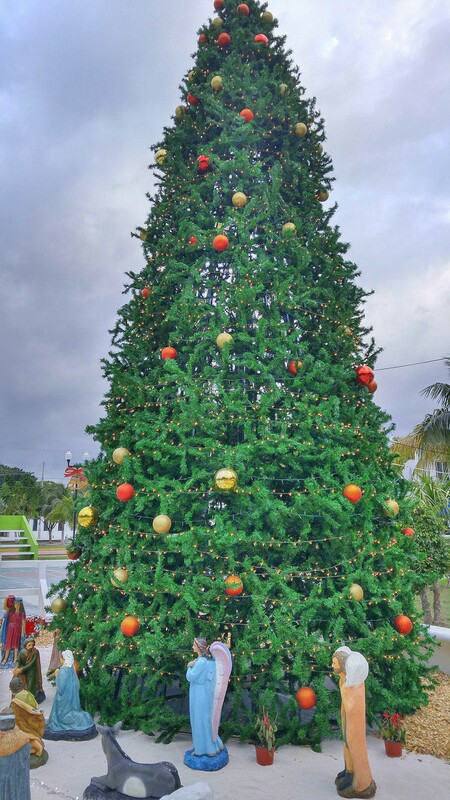 Feliz Navidad & a Wondeful 2018! 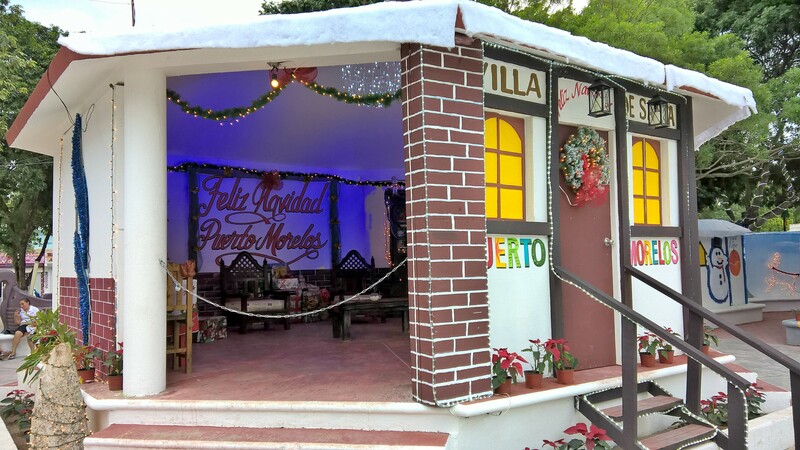 From Robert & Joanne at In Puerto Morelos & Casa de los Viajeros in Puerto Morelos, Mexico! We had an exciting 2017 with the sale of Alma Libre Bookstore. 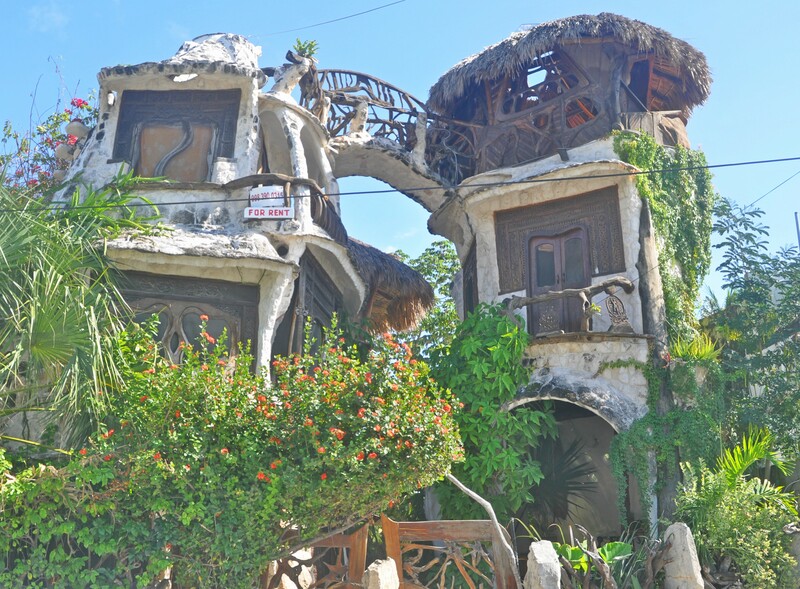 But do not fret, we are not leaving our lovely beach town. 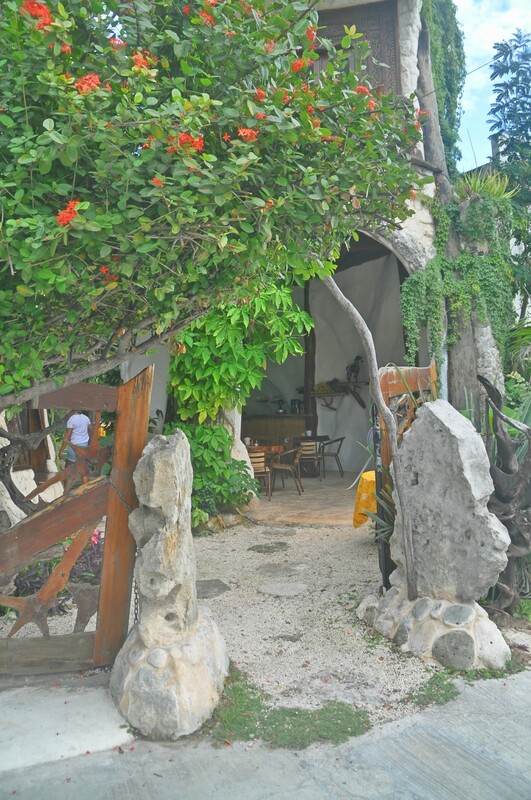 You will still find us at Casa de los Viajeros. 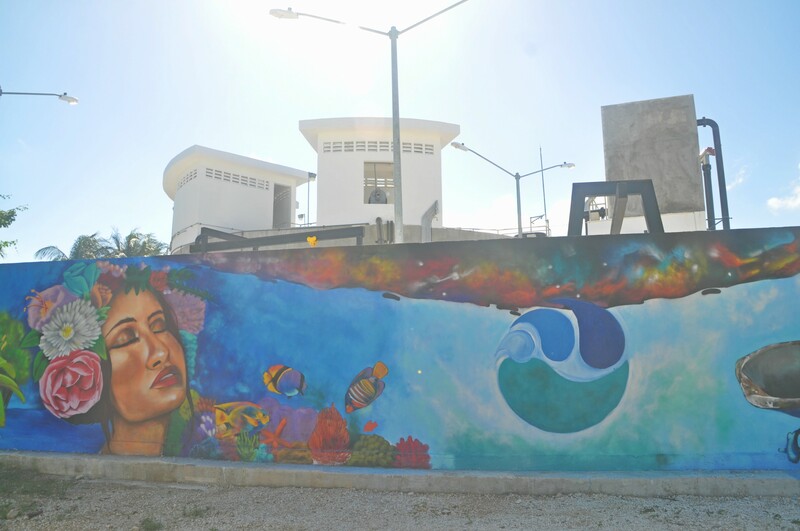 And we are still updating you on all the happenings in and around PoMo on our new website In Puerto Morelos. We hope that you will come visit us soon. 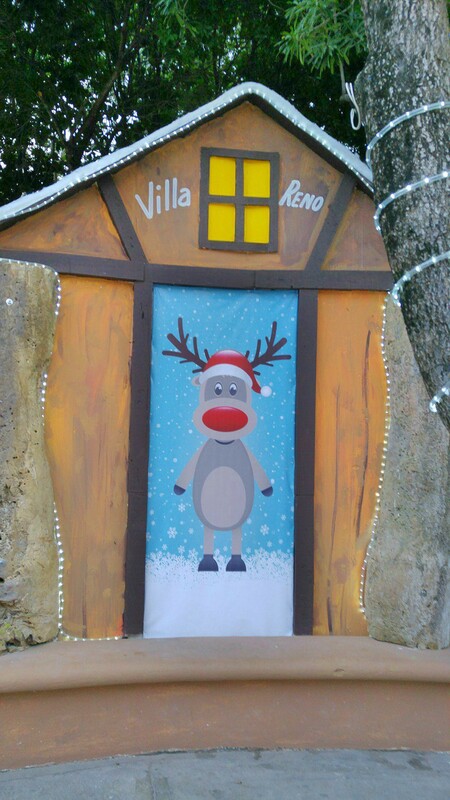 And don’t forget to tell your friends about us and our beautiful village. We are sure they could use a shot of vitamin PM sun and sand as well. All the best in the coming year and we hope to see you soon. 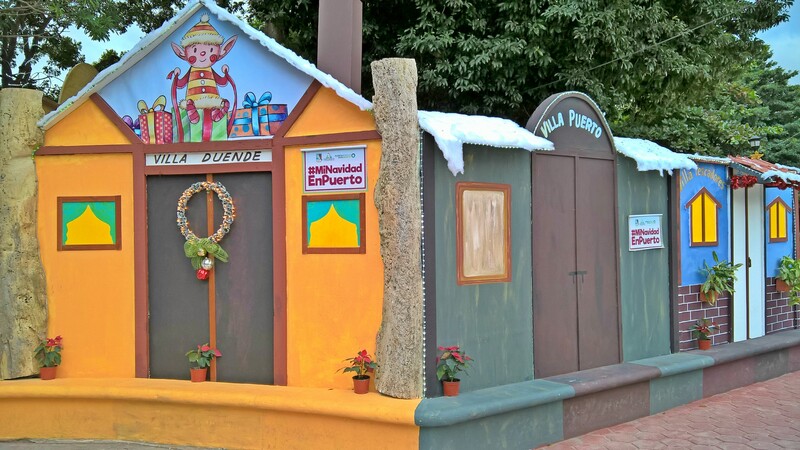 On a recent trip to the square in the Colonia in Puerto Morelos, we were surprised and delighted to be whisked away to Santa’s Village in the North Pole! 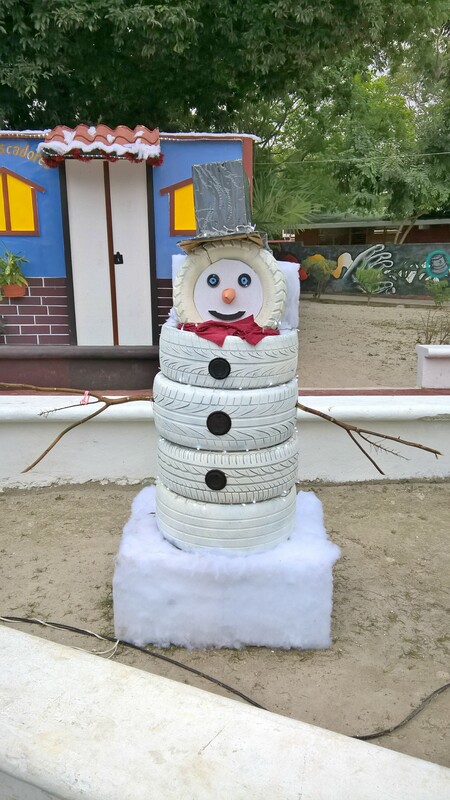 One of the highlights has to be this recycled tire snowman…who will not be melting anytime soon! 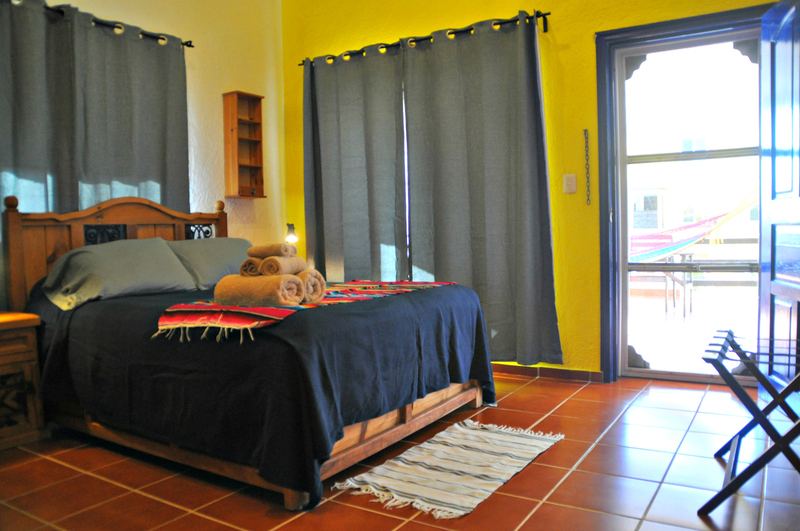 Also check out Casa de los Viajeros, a great place to stay in Puerto Morelos. 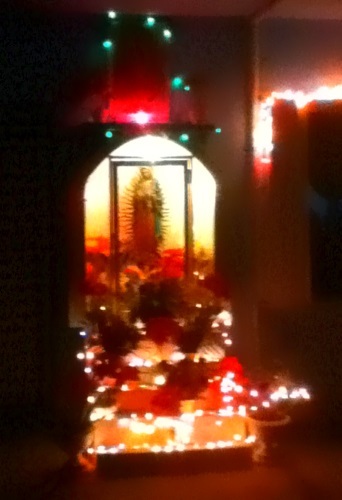 This is our Lady of Guadalupe who guards the front door to our home. December 12th is the Dia de la Virgen de Guadalupe or the Day of Guadalupe. Derived from the Catholic religion, Our Lady of Guadalupe or the Virgin of Guadalupe is seen everywhere in Mexico from candles in people’s windows to statues on cabbie’s dashboards to full altars in front of homes. 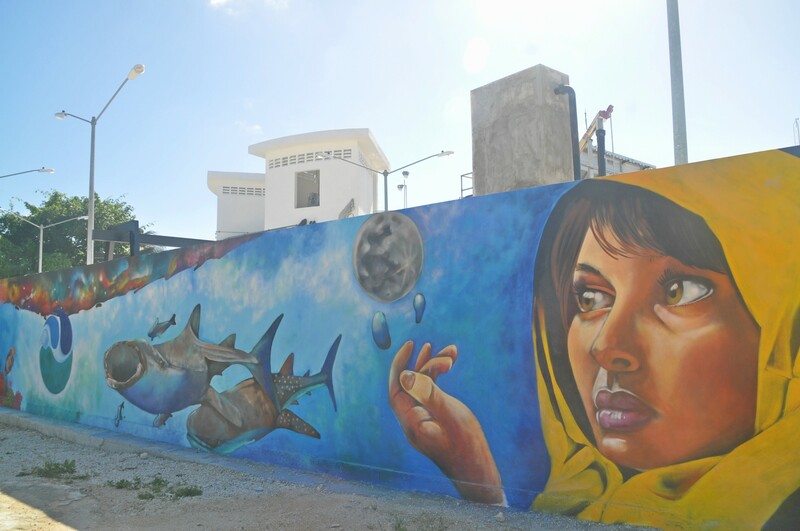 Many Mexicans have adopted this darker skinned version of the Madonna or the Virgin Mary, who was first introduced to the culture by Cortez, as their own. It is believed that she first appeared as a vision in 1531 to Juan Diego, a native Mexican peasant, on was on his way to mass. Since then the shrine of the Virgin of Guadalupe, at the Basilica of Guadalupe in Mexico City, has become one of the most visited Catholic pilgrimage destinations in the world, especially during the anniversary of the apparition. 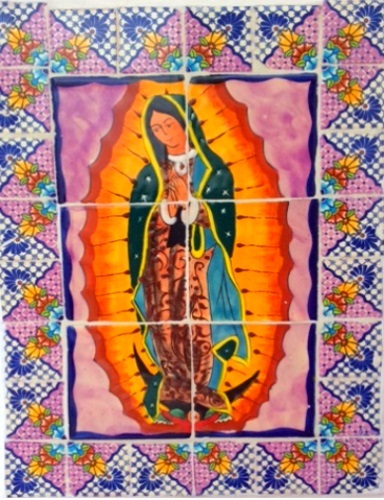 Leading up to December 12th the “Guadalupeans” show their devotions to the virgin by praying, biking, running, walking and illuminating their home altars. On a trip to Valladolid we saw dozens of groups of young men and women biking through the city, showing their dedication to the Virgin. 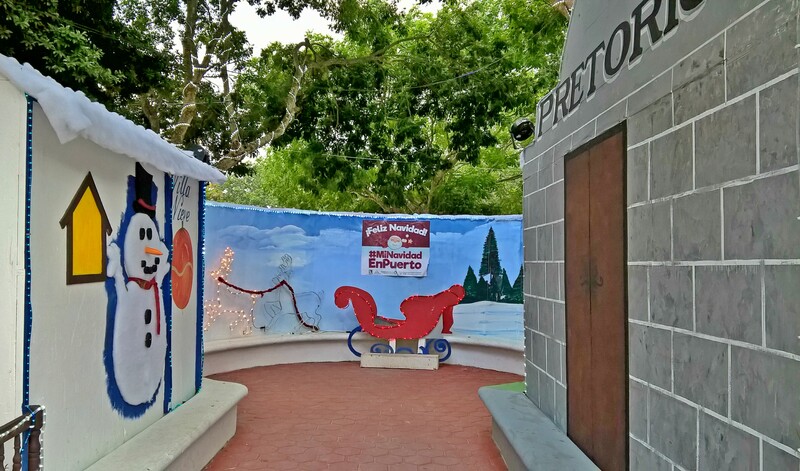 Puerto Morelos has several small parades on the 12th of December ending at the church on the main town square. This ritual happens at churches all around the country. Mexicans flock to their local churches and homemade memorials in their homes to worship Guadalupe. The prayers will be followed by a celebration and as always in Mexico, a large meal. For a more detailed account of the tale, check out Wikipedia or Smart History. 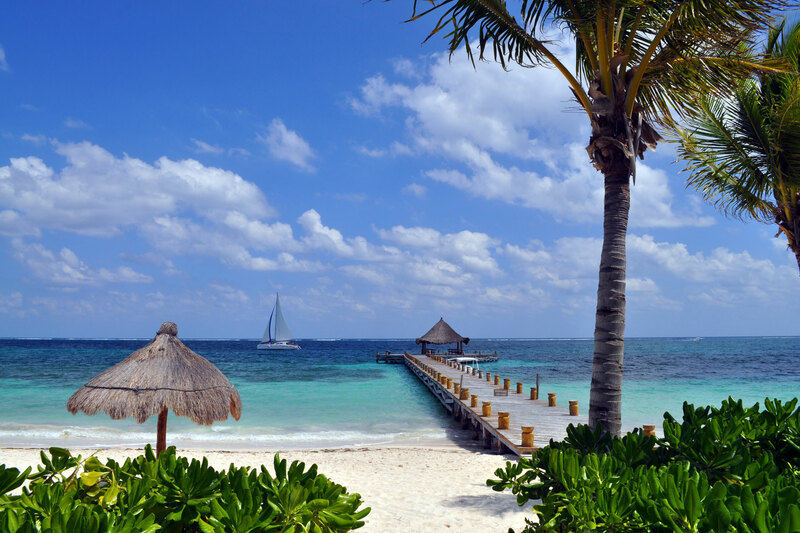 Spend Christmas in the sand instead of the snow! 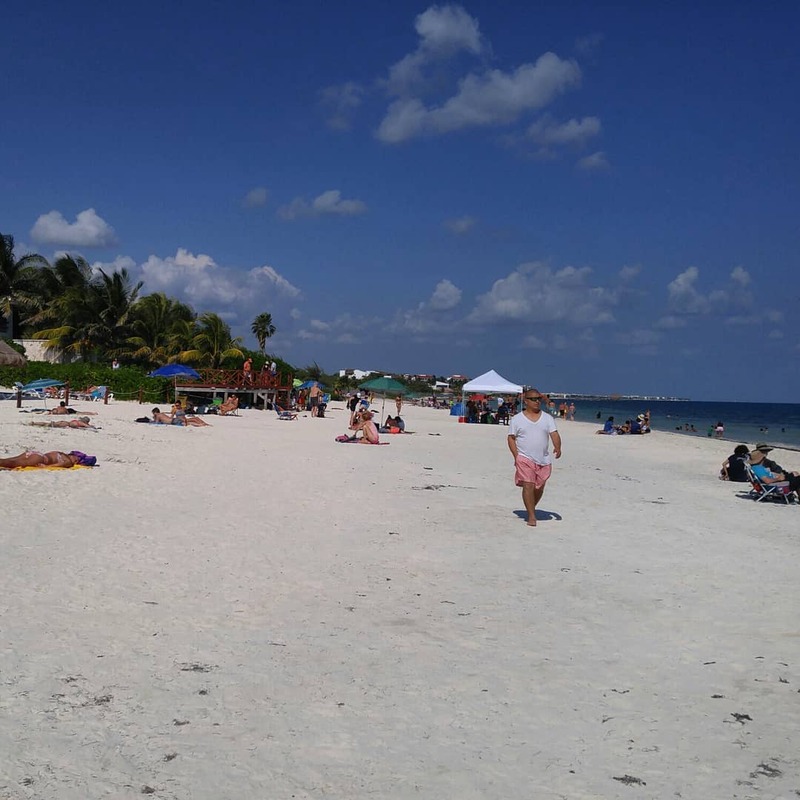 We have December 16, 2017 to January 5, 2018 open in our extra large 2 bedroom/2 bath private apartment, steps from the beach. 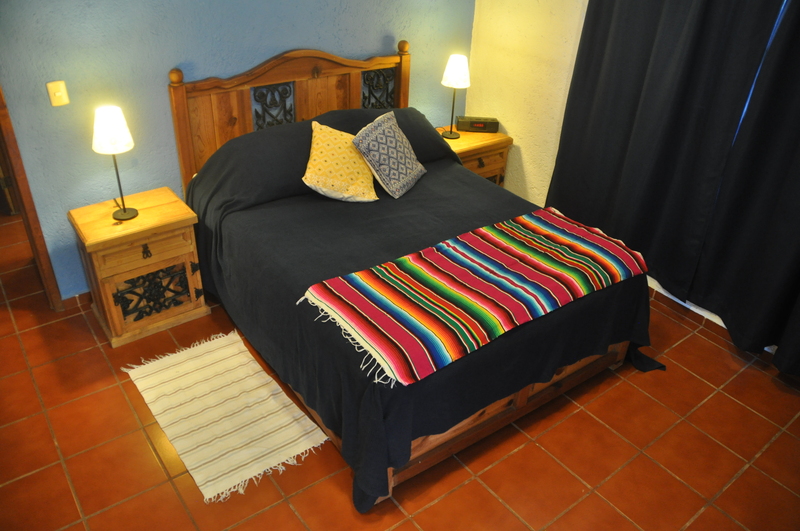 Contact us today about our special rate for this time. Avoid booking fees by dealing directly with us! 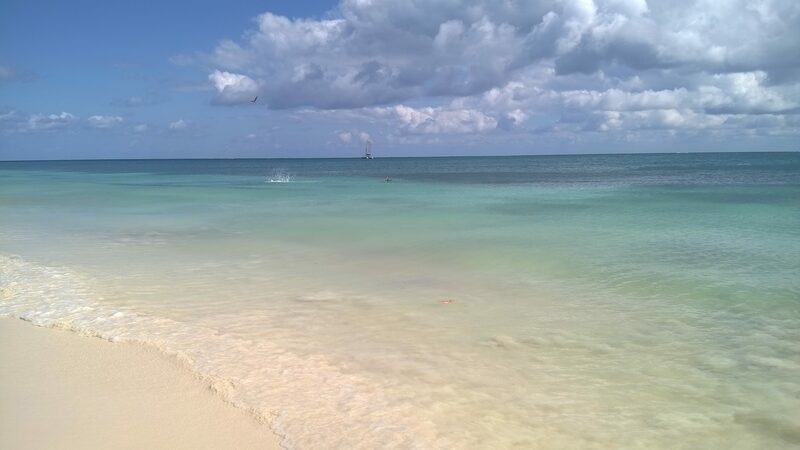 Hola again from Puerto Morelos! 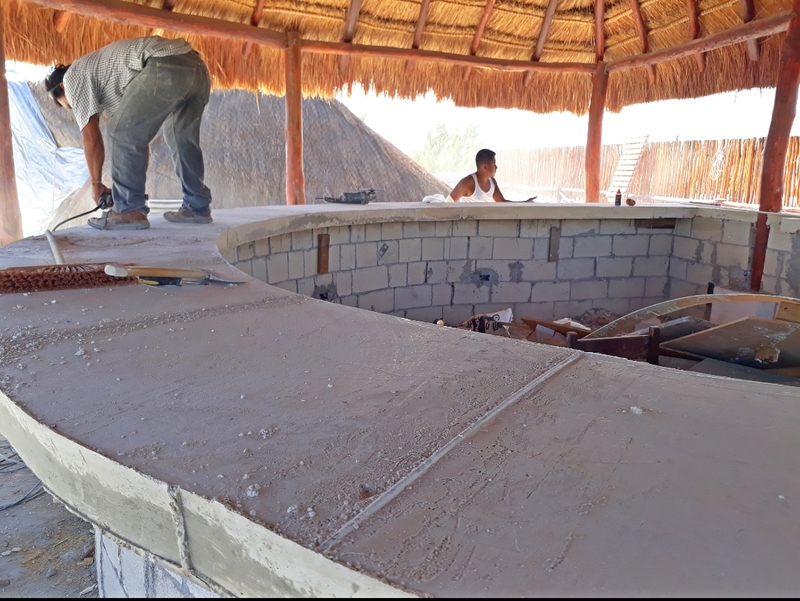 We continue our series of new and exciting things in Puerto Morelos for the 2017/2018 season. 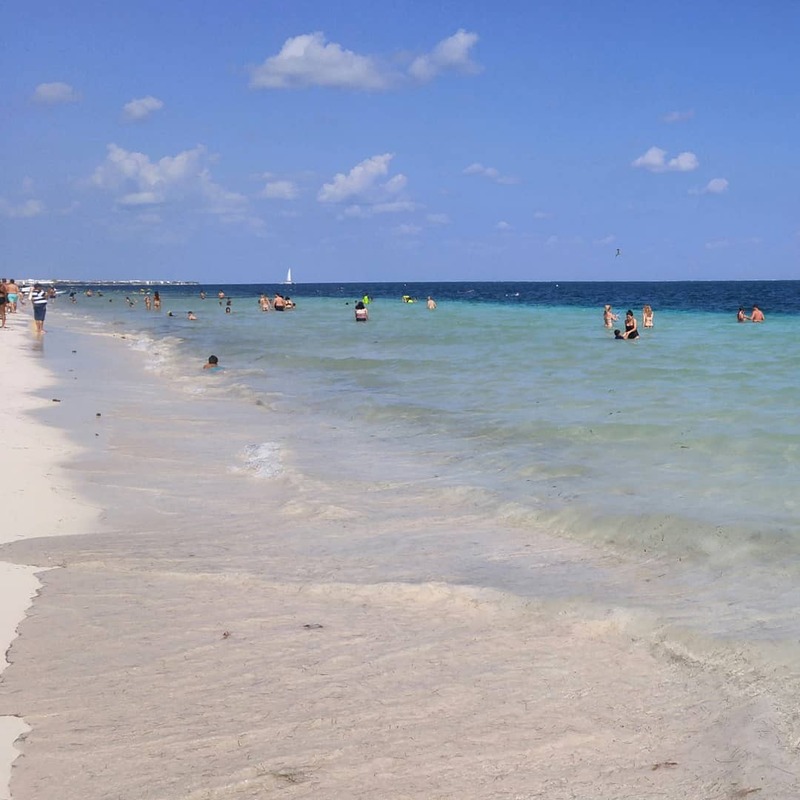 This series of posts represent an updated version of our long-running Beach Reads Newsletter. 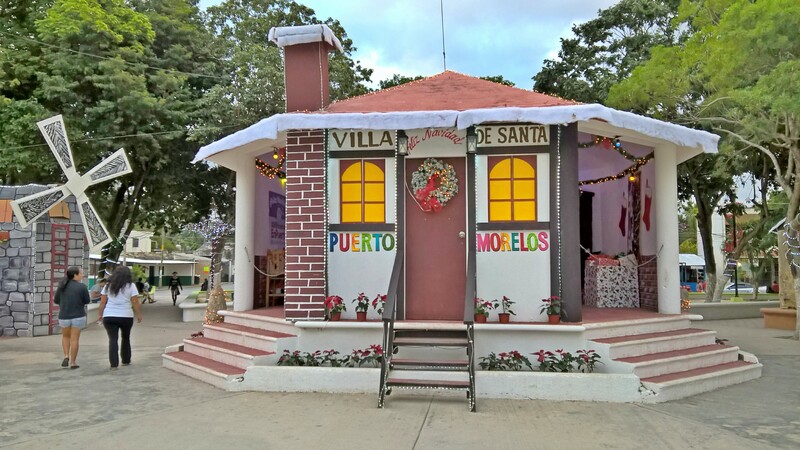 These posts are part of our new home on the web, InPuertoMorelos.com, where you will find loads of information on your favourite Mexican village, including an interactive map, restaurant list, current taxi fares and more. 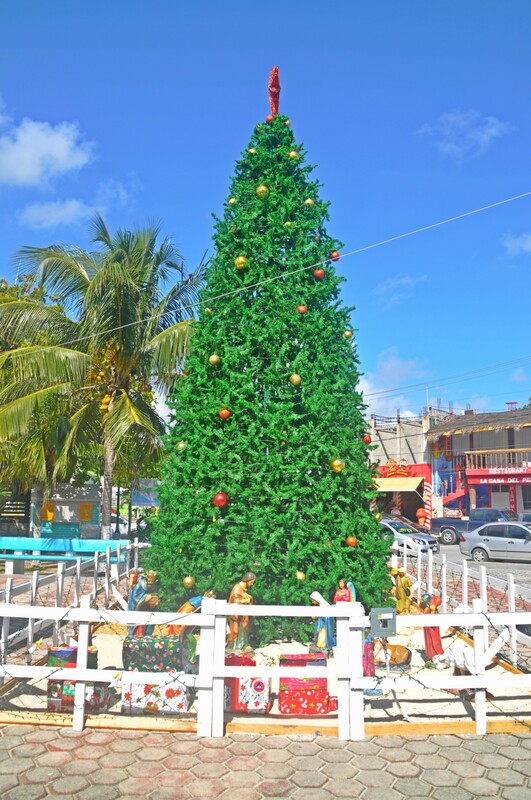 Christmas has come to the square in Puerto Morelos! The giant tree is back! 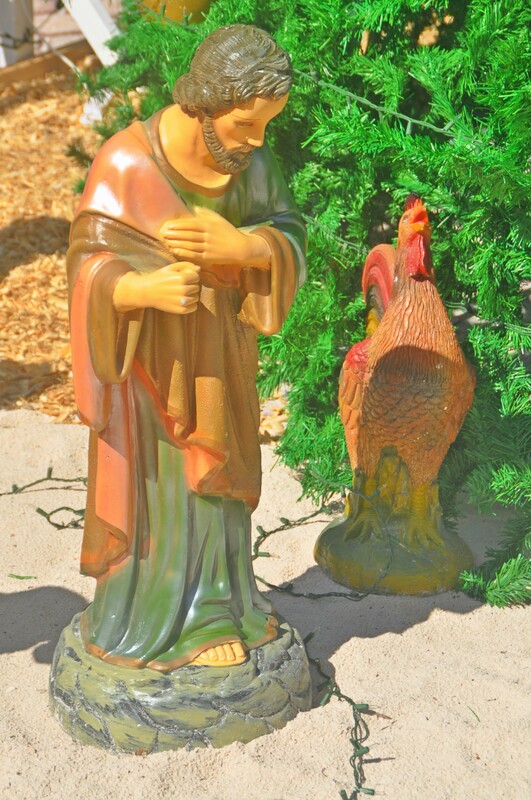 There is a Nativity Scene below the tree, which features all the main characters of the Christmas Story, including this giant rooster, who is nearly the same height as Joseph. Someone painted a really big mural on the large wall that surrounds the plant. 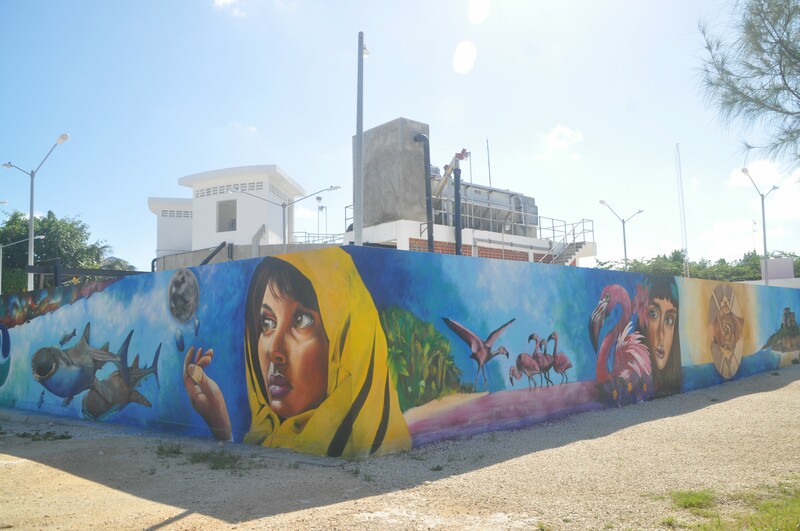 I would rarely suggest a sewage plant as a tourist destination, but the mural is really worth a look! 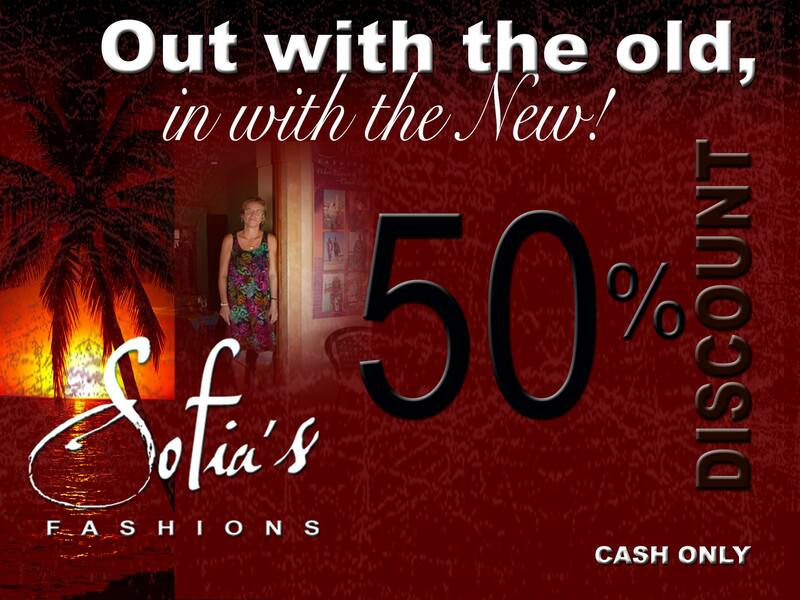 Sofia’s Fashions on the square is closing at the end of the month so everything in the store is on sale 50% off! Store hours 9:00am-5:00pm Tuesday-Saturday. 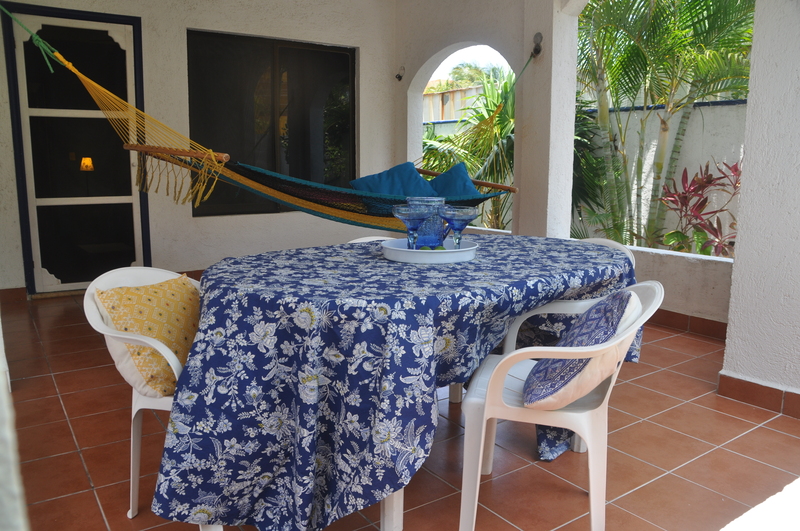 Owner Sharon is closing the shop, but staying in Puerto Morelos. 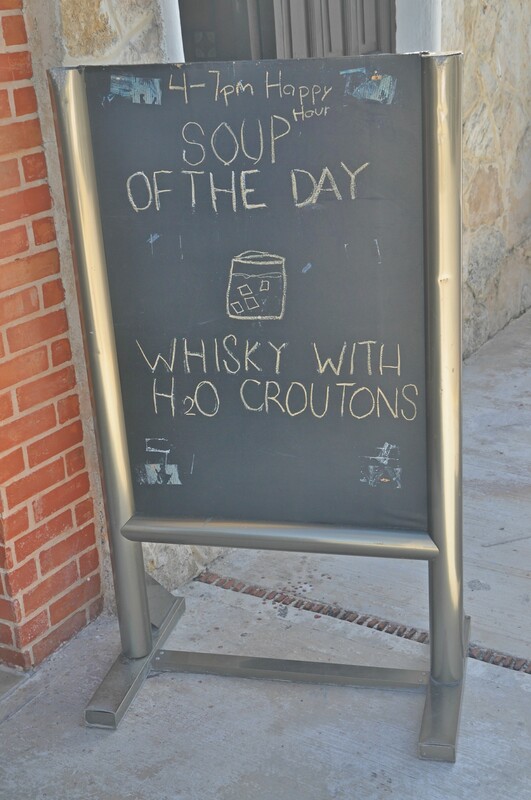 Happy Hour Soup of the Day at Hacienda Morelos…. Did you miss Part I? Find it here Did you miss Part II? It’s here. Part III is here. More links to other articles on the right side of this page. 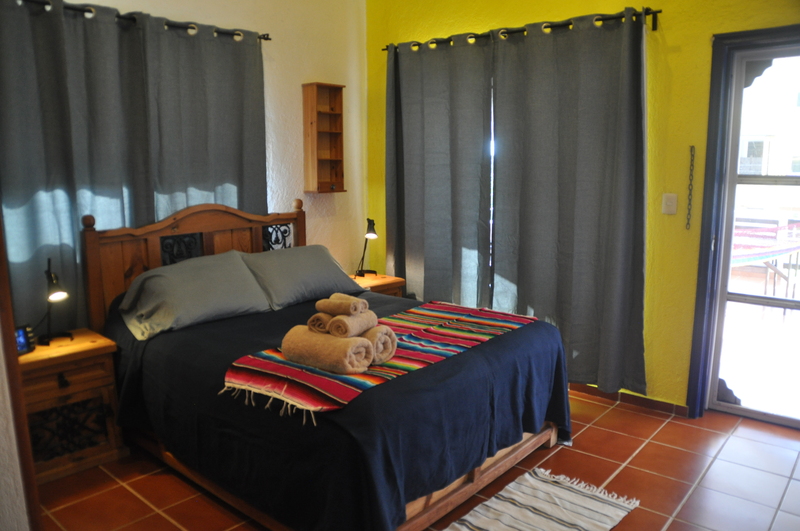 Our place is just steps from the beach, and close to the square. 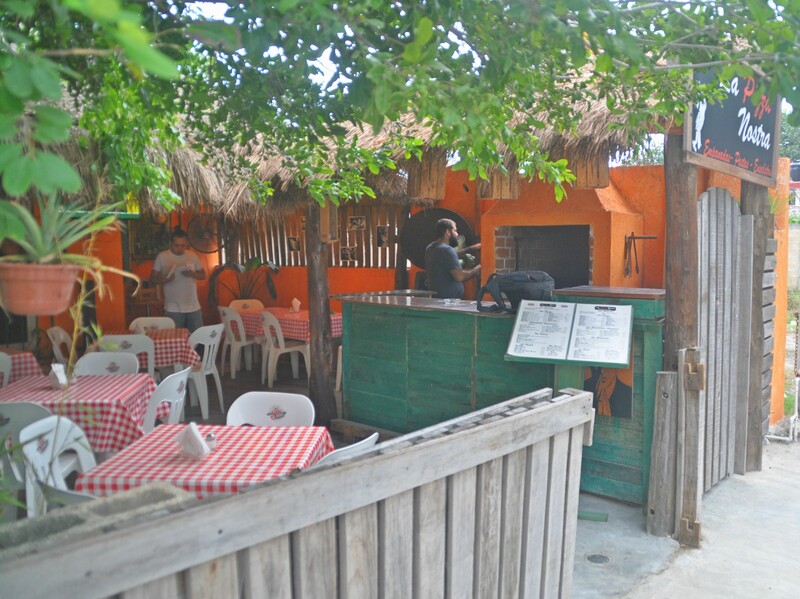 Tanino’s has been a favourite in Puerto Morelos for many years. The only problem, is that it was a little hard to find. Now they have solved the problem by moving to a bigger location on Rojo Gomez. They have done an amazing job converting an old house one block north of the square into a cool, tranquil eatery. 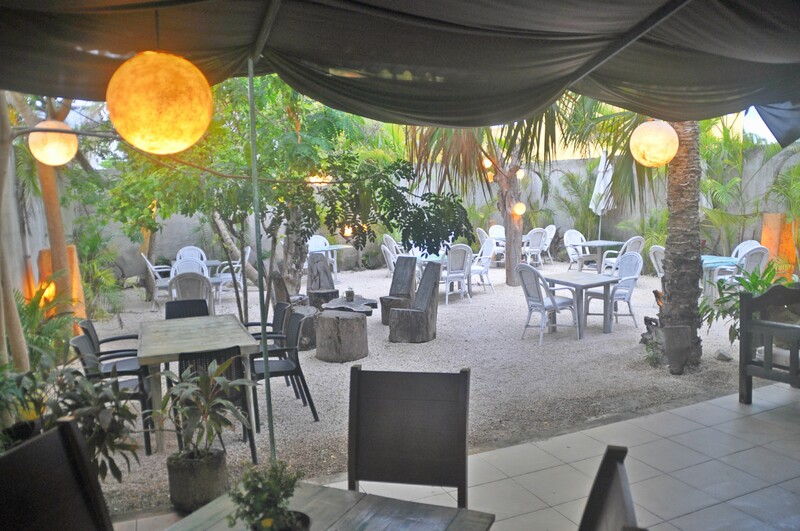 Their menu includes some good-looking appies, salads, pasta, surf & turf entrees and of course, a good, long wine list. They are open daily from 5:00 to midnight. Closed Sunday. 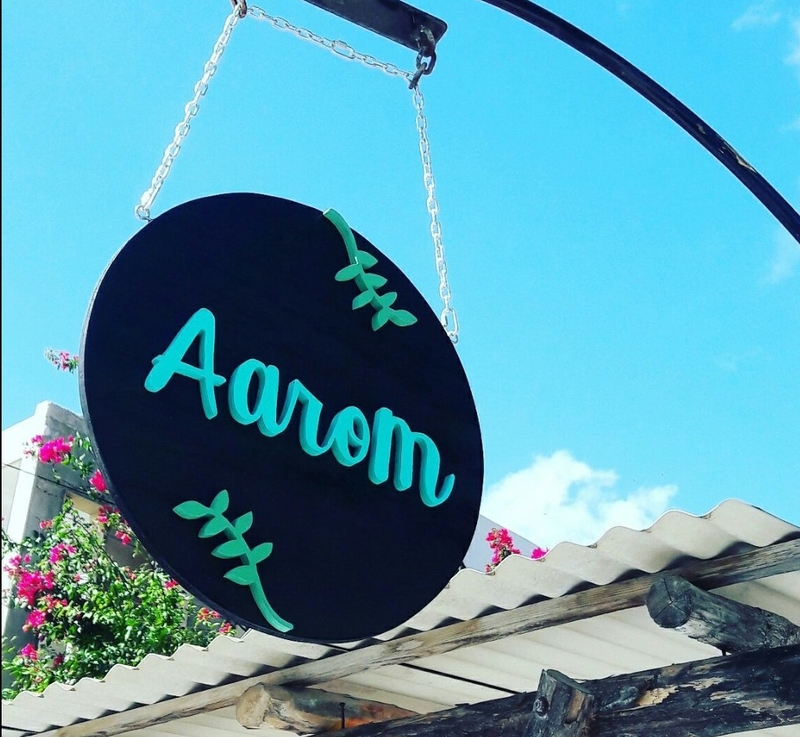 Several restaurants in Puerto Morelos are upping their game for the new season, example: La Pizza Nostra is expanding beyond pizza pie to include specialties from the grill. They built a new setup to accommodate their new meaty menu. Follow your nose to La Pizza Nostra, just half a block north of the square on Rojo Gomez. They are open 5:00 – 11:00 daily, except Wednesday. 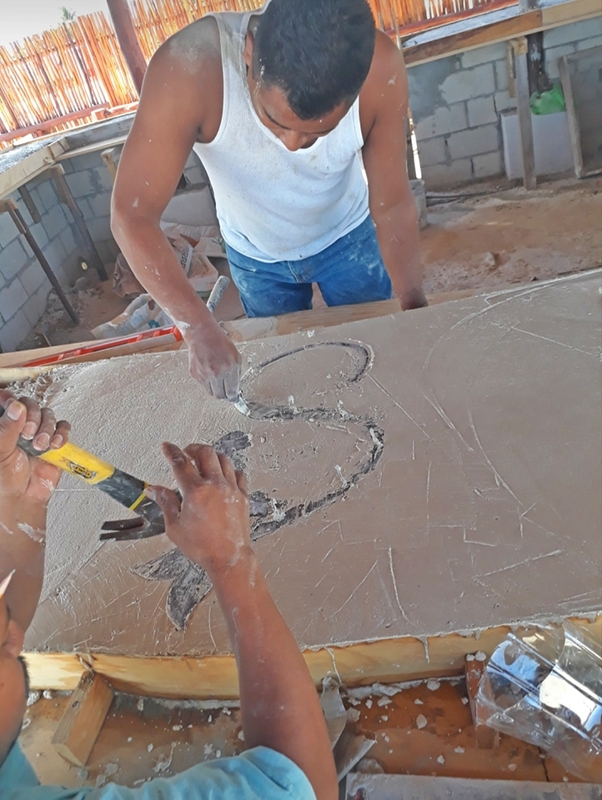 Not to be outdone, La Sirena is also working on a secret project on their roof. 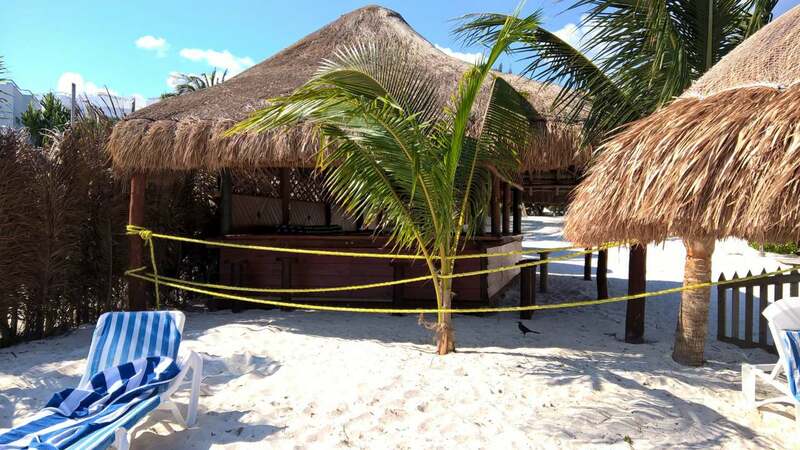 To this reporter, it looks like a huge outdoor space with a palapa-covered bar. This would be a great place to catch an evening breeze and the colours of a PM sunset, with a view of the ocean and lighthouse. 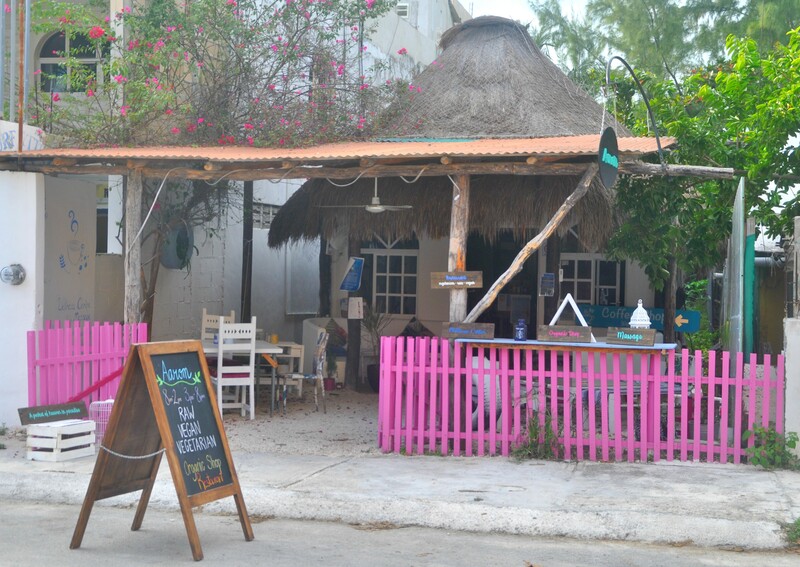 Affable La Sirena owner Anthony is sticking to his story that it is Puerto Morelos’ first and only mini golf course. We’ll keep you posted. 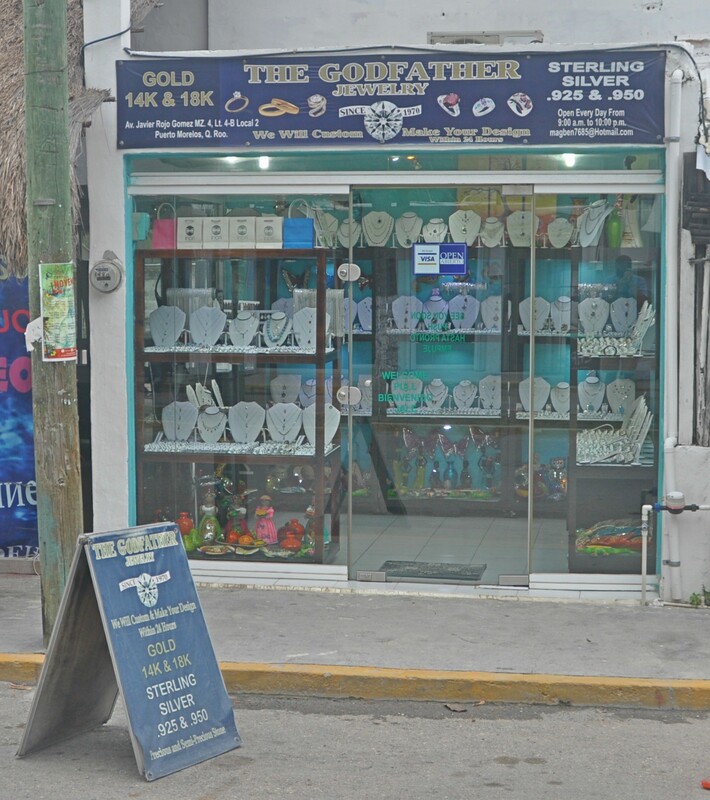 The Godfather has long been our “go-to” recommended place for jewelry. They not only sell beautiful bling, they design it too! 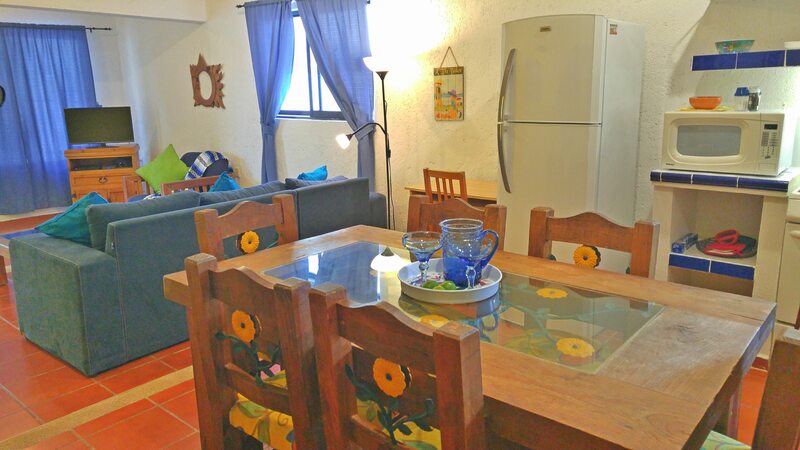 Meaning you can create your own custom design while enjoying your vacation in Puerto Morelos. They also do repairs on your jewelry. They fixed a piece for us, I wish I could say it was as good as new, but it was much, much better than when we bought it new. The owners are also the friendliest couple in town. We have sent dozens of people there over the years and everyone has been happy. 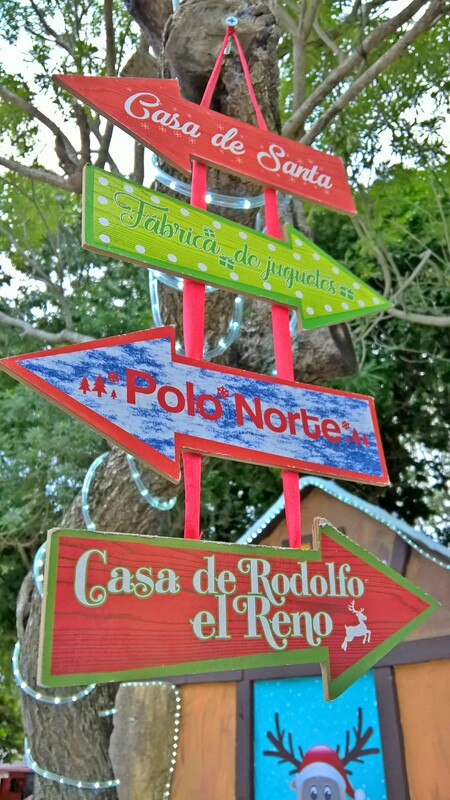 Check them out, they are just north of the square on Rojo Gomez. It’s a small store, but a big selection. Tomorrow, more news from your favourite town! Did you miss Part I? Find it here Did you miss Part II? It’s here. More links to other articles on the right side of this page. La Guaya has taken over the old Carpe Diem space. It is a cafe and bakery. 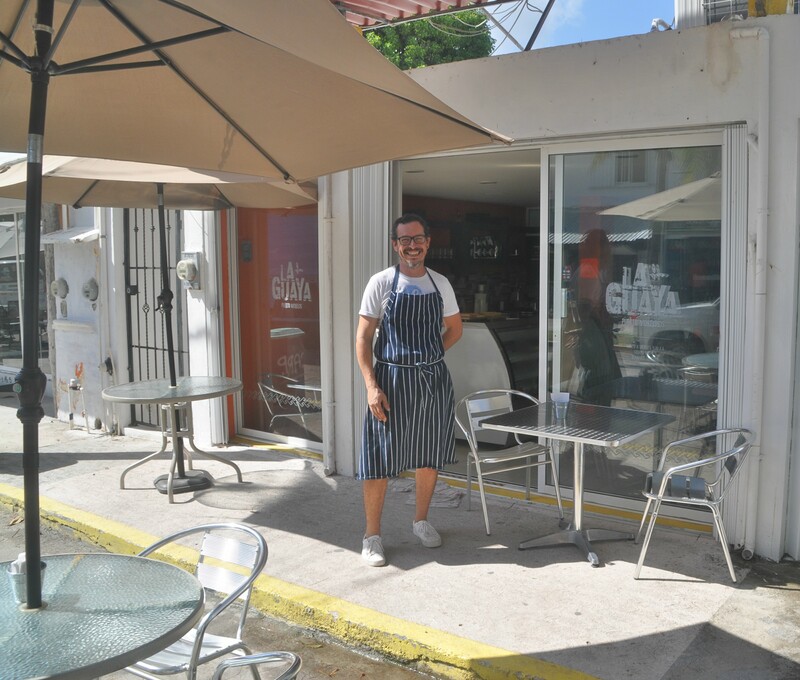 The brains behind the operation is Pablo Espinosa, who gained fame and fans here in PM as the originator of El Nicho. Pablo calls his new venture a “small sandwich and wrap place”, and they will make their own bread and other baked goods. Yum! 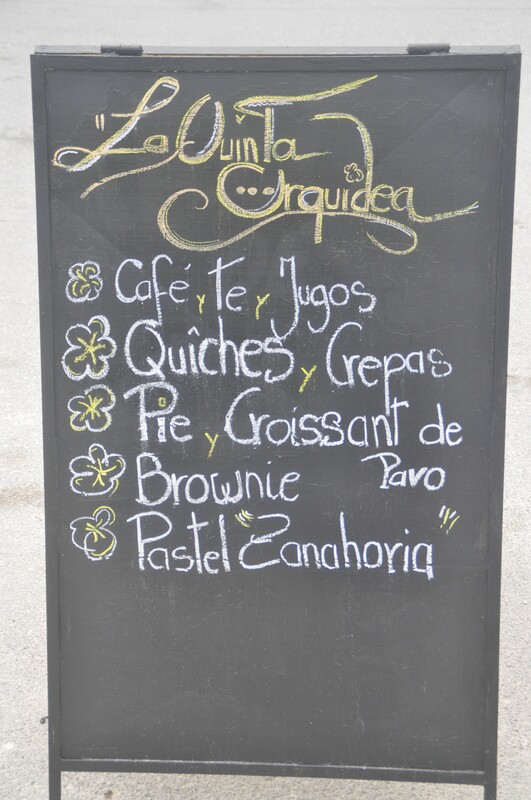 La Guaya is open Monday through Saturday from 9:00-4:00. Closed Sunday. In other “non-cafe” news, a new burger place is opening on Rojo Gomez, right next to I Wanna Pizza. There were some rumours of a big burger chain moving into our town, but it’s actually a small one called A La Burger. They have at least three locations in Cancun and say they use 100% Angus meat from Monterrey. Their menu includes burgers, fries and salads. 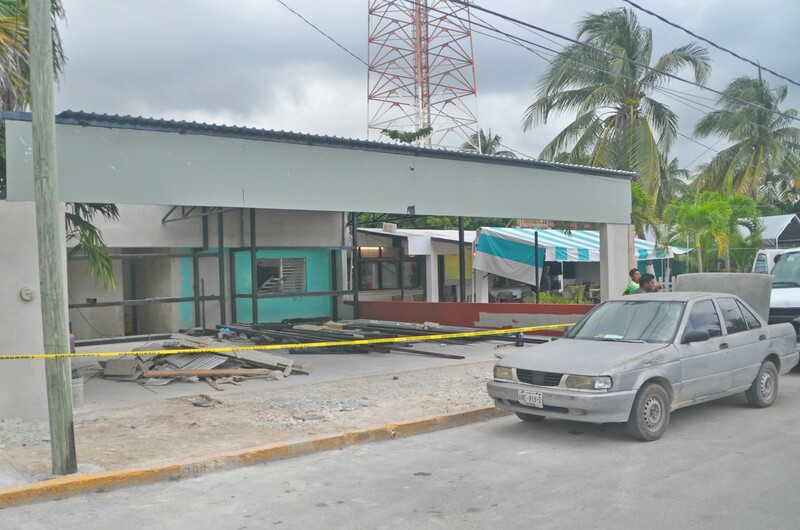 The restaurant site is still under construction. No word on when they are opening, but I bet it will be soon. The north end of Rojo Gomez is becoming a bit of a “restaurant row” now. A larger chain on the way to the port side of PM is Farmacia Similares. 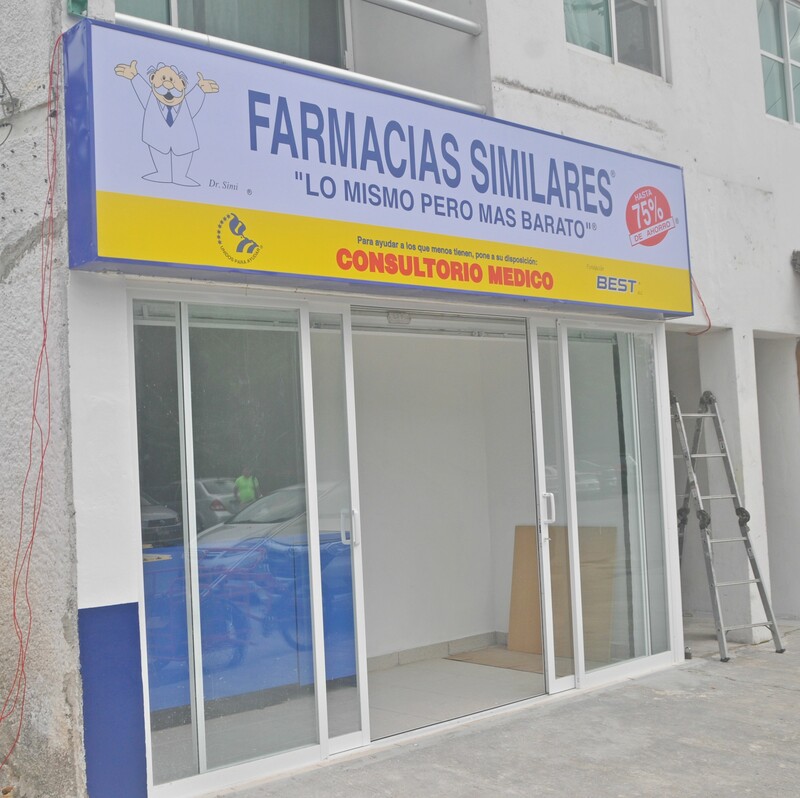 They are well known in Mexico for their low drug prices and their over-sized dancing pharmacist mascot. (I am not kidding). They are just setting the store up, but from the sign it looks like they will have a doctor onsite so you can see the doc and get a prescription in one trip.They are located in the space formerly occupied by Natura restaurant, the same building that Carlos the dentist has his office. 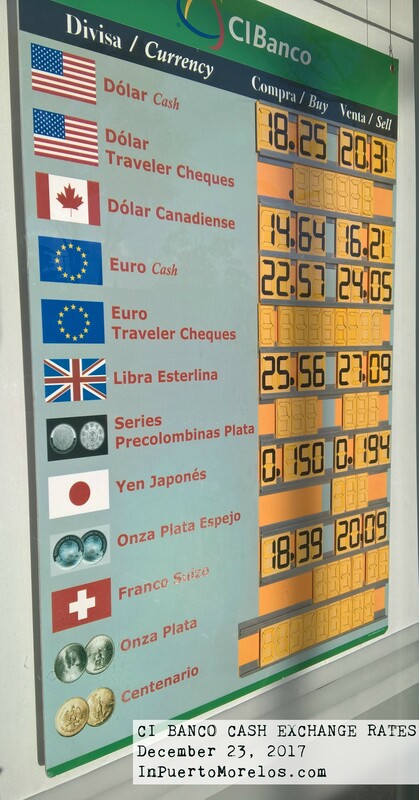 They already have two locations in the Colonia. Click here to see the dancing pharmacist. 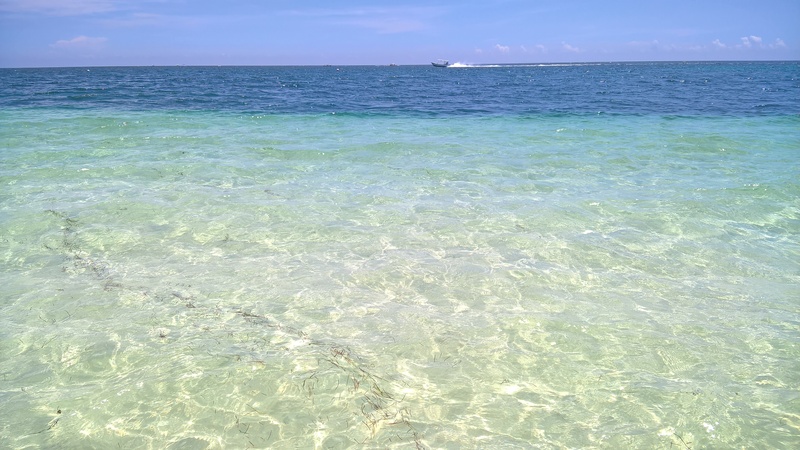 Hola from Puerto Morelos! We had a good summer here, and we are happy to see the season starting again. As usual, there are lots of changes to tell you about. Since 2002 we have been keeping you up to date with all things PM in our infamous newsletter, Beach Reads. Times have changed, so instead of a long newsletter, we’ll tell you all about it in a series of posts here on InPuertoMorelos.com, which is our new home here on the web. 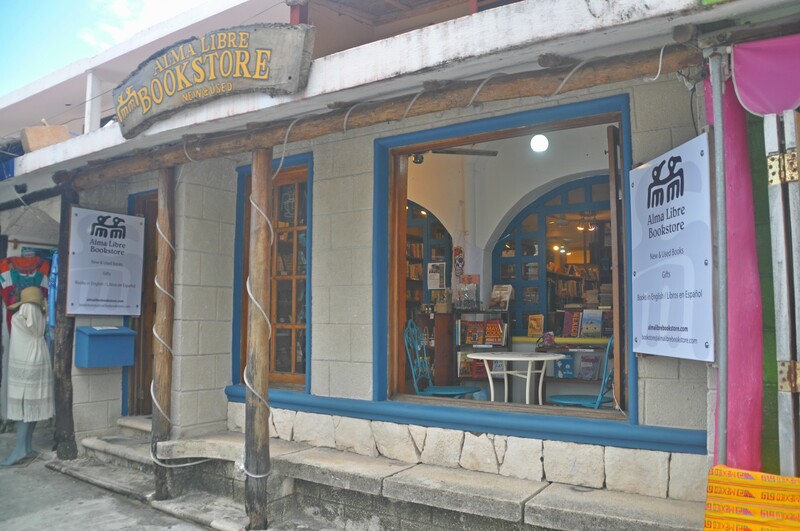 Alma Libre Bookstore is open again! 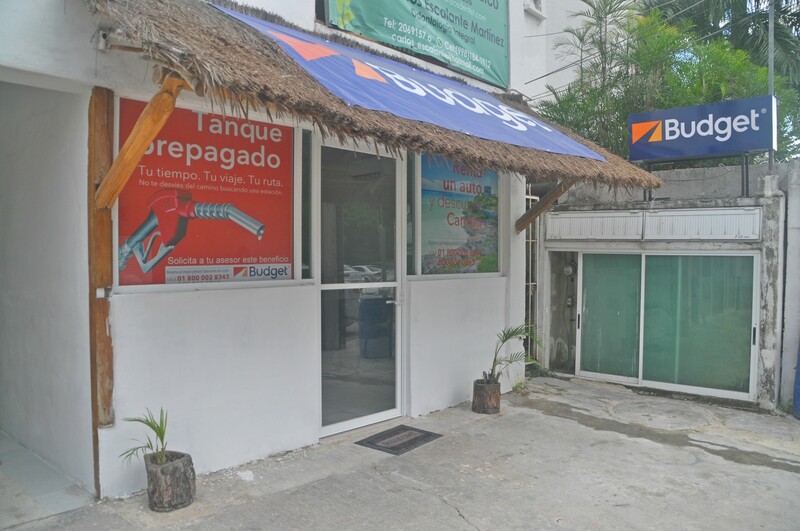 In the past year we lost a couple of cafe/restaurants in Puerto Morelos, but now over the summer, we gained four! 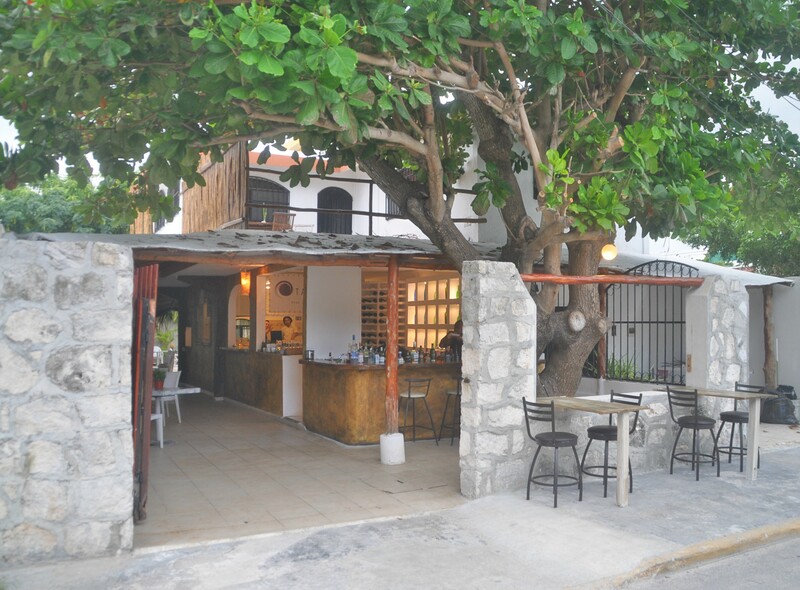 Mangata Cafe opened in November just down the Niños Héroes road, right beside John Gray’s Kitchen. 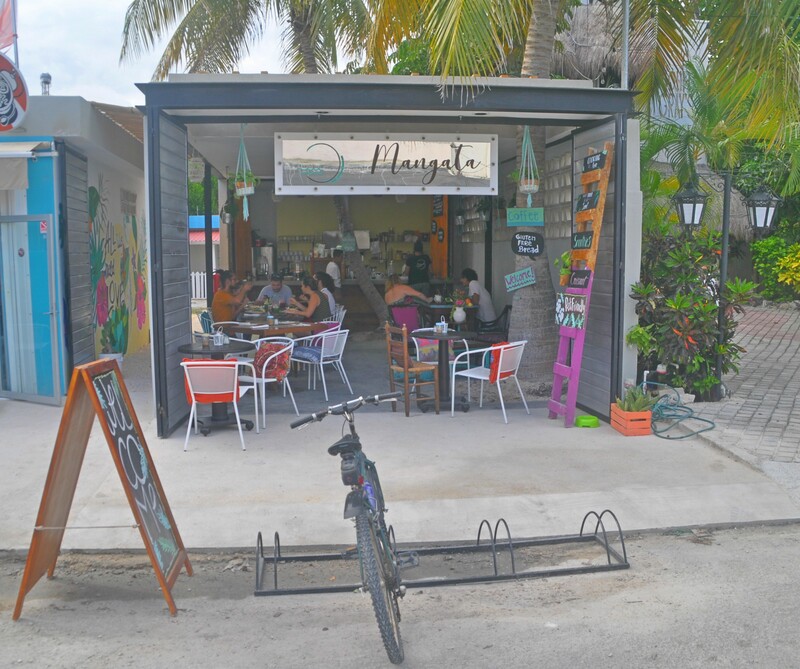 Built very cleverly to make take advantage of our bright & breezy days, they offer lots of choices including juices, smoothies, coffee and meals. Vegetarian and vegan options too. They promise they make everything with love! Open Tuesday to Saturday 8-5. Sunday 8-3. Tomorrow, more news and more cafes from your favourite town!